The guest list of Conservative Party donors wined and dined by David Cameron and his wife Samantha at Downing Street and Chequers has been revealed today. 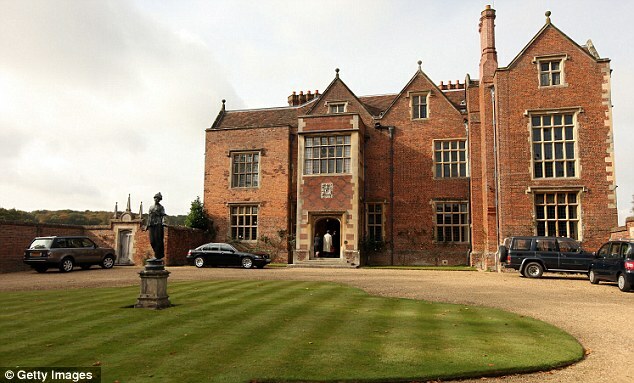 Lord John and Lady Sainsbury, secretive tycoon David Rowland – once branded a ‘shady financier’ – and billionaire City businessman Michael Spencer, are among the 26 people who have been invited for supper with the Prime Minister either at Number 10 or his country residence Chequers. Mr Cameron – who sometimes cooks – confirmed he had dinner with ‘significant’ Conservative Party donors at his flat on three occasions since becoming Prime Minister, as well as at a post-election dinner in No 10 in 2010. Today he pledged to publish a quarterly register of any future meals at official residences with people who have given more than £50,000 to the Tories. 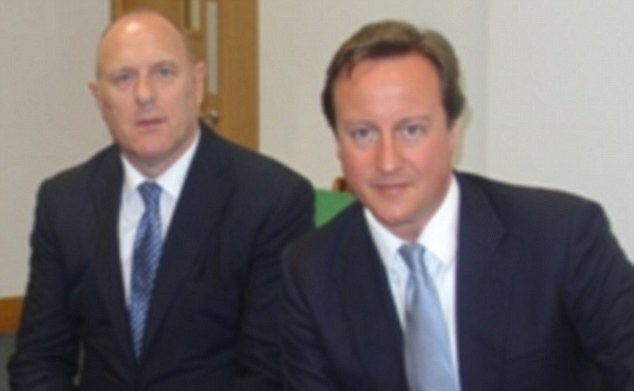 The announcement came as Mr Cameron was put under huge pressure over claims by former Tory co-treasurer Peter Cruddas that individuals could secure meetings with ministers and influence policy formation in return for a ‘premier league’ donation. 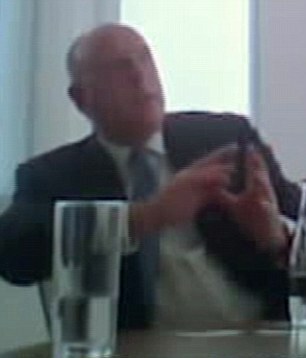 Mr Cruddas quit on Saturday after the Sunday Times published secret recordings in which he urged undercover reporters to give more than £250,000 in return for direct face time with senior ministers. Mr Cameron yesterday denounced his comments as ‘completely unacceptable’ and announced an internal party inquiry to ensure there would be no repeat. And senior Tory Francis Maude this morning appeared to hope that this had drawn a line under the affair, telling BBC Radio 4’s Today programme it was ‘a bit of a nonsense’. But it was later announced that Mr Maude would give an oral statement to the House of Commons this afternoon to update MPs on reform of political party funding. And Mr Cameron broke into a scheduled speech on dementia care in London to address the Cruddas affair head-on. He confirmed that he had held a post-election ‘thankyou’ dinner for supporters, including some major donors, in 10 Downing Street in July 2010, followed by three private dinners in the flat above Number 11 where he lives with wife Samantha. He denied that any of those invited had been recommended by Mr Cruddas, describing most of them as people he had known for many years. Neither had Mr Cruddas – himself a big donor to the Tories – ever attended a Downing Street dinner. ‘In the two years I have been Prime Minister, there have been three occasions on which significant donors have come to a dinner in my flat. In addition, there was a further post-election dinner which included donors in Downing Street itself shortly after the general election,’ said Mr Cameron. It was publicly known that the Conservatives held regular dinners with the PM and other ministers for the ‘Leader’s Group’ of donors who give more than £50,000, said Mr Cameron. From now on, the party will publish a register of attendees at these events. Mr Cameron dismissed Mr Cruddas’s promise that major donors’ concerns would be fed into a Downing Street ‘policy committee’. No such committee exists, and members of the Number 10 Policy Unit had never met anyone as a result of a request from the former co-treasurer, he said. The internal Conservative inquiry into the Cruddas affair will be led by Tory peer and prominent lawyer Lord Gold, said the Prime Minister. 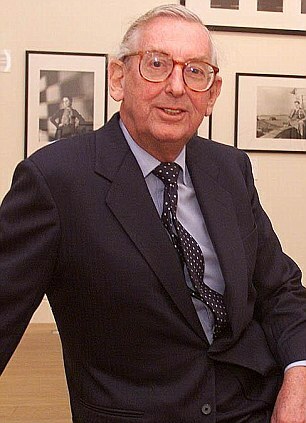 It had earlier been reported that Tory co-chairman Lord Feldman would lead the probe. WHO HAD A DINNER INVITE TO DAVE AND SAM’S? February 28, 2011 – Downing Street flat. October 15, 2011 – Chequers – A charity fundraiser in aid of Mencap and three smaller charities in aid of disabled children, attended by a large number of people, including donors to both the Labour Party and the Conservative Party. November 2, 2011 – Downing Street flat. Described as a ‘social dinner for strong and long term supporters of the party, with whom the PM has a strong relationship’. Lord Feldman is said to have visited Chequers on ‘several occasions’ as Conservative Party co-chairman. The Prime Minister renewed calls for Labour to agree on a cap of £50,000 on donations to parties, but insisted that this limit must apply not only to individuals and companies but also to unions – something Labour has always resisted. 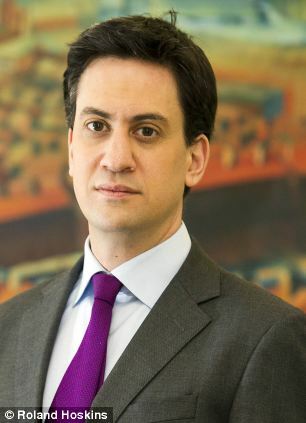 Labour leader Ed Miliband will respond to Mr Maude’s statement in the Commons this afternoon, and said he had contacted Downing Street to say that it was Mr Cameron – and not his Cabinet Office minister – who should address MPs. 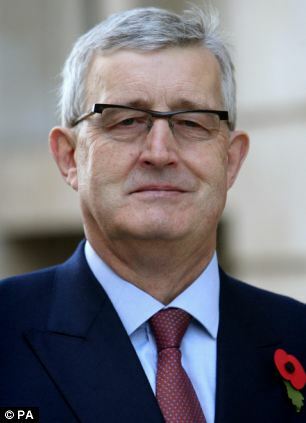 The Conservative Party said that a post-election ‘thank-you dinner’ was held at 10 Downing Street on July 14 2010, attended by Anthony Bamford of JCB, hedge fund tycoon Michael Hintze, Tory peer Lord Sainsbury of Preston Candover, Lansdowne Partners chief executive Sir Paul Ruddock, City financier Mike Farmer and Michael Freeman, as well as their spouses. 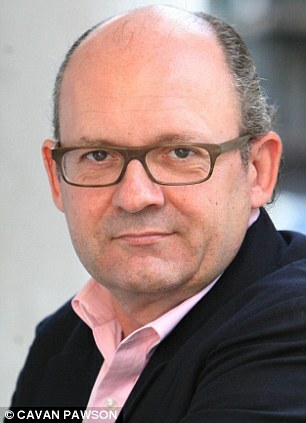 Telegraph Media Group chief executive Murdoch MacLennan, who is not listed by the Electoral Commission as a donor to the Tories, also attended. On February 28 last year, property tycoon and major donor David Rowland, who had previously been appointed party treasurer but quit before taking up the post, attended a dinner in the flat, along with party co-chairman Lord Feldman. 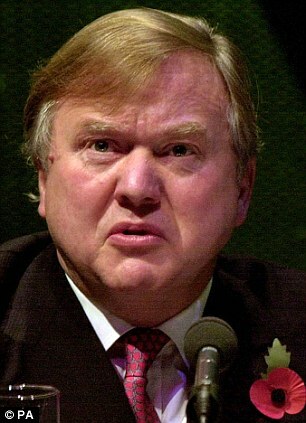 Mr Rowland spent some 40 years as a tax exile and on his return to Britain, began giving generously to the Tory Party, eventually donating over £4million. He has had an extremely controversial business career, being once described as ‘shady’. 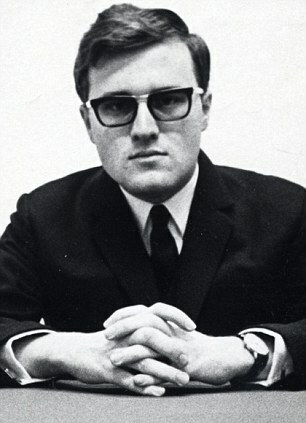 He attracted unproven accusations of misallocating millions of dollars in New Zealand, and also of asset-stripping. On November 2 last year, Mr Cameron held a ‘social dinner for strong and long-term supporters of the party, with whom the PM has a strong relationship’, including banker and Tory donor Henry Angest, Mr Farmer and oil company boss Ian Taylor. And on February 27 this year, he held a social dinner with former treasurer and major donor Michael Spencer and his partner. An aide to the Prime Minister said he would not be releasing retrospective records of party dinners at Chequers as it would be difficult to provide an accurate record, but added that there had been no ‘donor only’ meals at the grace and favour estate. News Corporation chairman Rupert Murdoch, whose own meetings with politicians have come under intense scrutiny as a result of the News of the World hacking scandal, called for an independent inquiry into the ‘cash for access’ affair. Sir Christopher Kelly, chairman of the Committee on Standards in Public Life, last night warned that the revelations were ‘not an isolated incident’. He added: ‘As long as we have a system in which the main political parties are reliant on very large donations from very rich individuals – or organisations, in the case of the Labour Party – then events of this kind are almost bound to happen. The revelations are deeply embarrassing for Mr Cameron, who pledged two years ago to crack down on the shadowy world of lobbying. The existence of secret dinners with donors also undermines the Coalition’s much-vaunted transparency drive, which allows the public to see who ministers have met in their official capacity. Downing Street insisted that the Government had been ‘more transparent’ than any previous administration. 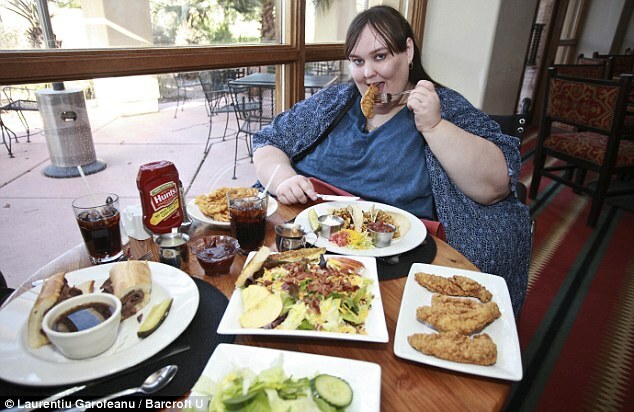 A mother bidding to become the fattest woman in the world has become engaged to marry a chef. Susanne Eman, 33, revealed her controversial dream of reaching a target weight of over 115 stone last year – to become the biggest human ever. Now the mother-of-two, who currently weighs more than 54 stone, plans to wed fiance Parker Clack, 35, who loves cooking for her. The pair met over the internet last year and hit it off following a string of emails. Within months Parker moved in to Susanne’s home in Casa Grande, Arizona, where she lives with sons Brendin, 13, and Gabriel, 17. Unemployed Susanne said: ‘We are a match made in heaven. I love eating and Parker loves cooking. ‘It’s a perfect pairing. I still want to be the fattest woman in the world and Parker is fine with that. ‘He loves larger women and sees how happy I am when I’m eating. ‘His cooking skills were definitely part of the attraction. How could I resist a man with talents in the kitchen? ‘His signature dish, spaghetti bolognese, is my favourite. I could eat it all day. ‘Parker helps by doing the housework too. Amazingly Parker is supporting Susanne in her controversial goal of becoming the world’s heaviest. Seen here dishing up a home-cooked breakfast for her, Parker cooks mountains of bacon and scrambled eggs, fried potatoes, huge slices of toast and even salad for Susanne. Parker said: ‘I support her because it makes her happy, and I love big women. ‘I do worry about her health of course, but I try to make sure she eats some healthy food like salad, and I make sure she does exercises. ‘She’s taken up swimming since we met and we love to swim together. ‘I know becoming the biggest woman ever is something she truly wants to do with all of her heart. ‘She had a check up last year and the doctor said she was fine, even though he doesn’t support her mission. He said she’s gambling with her life. ‘As long as the doctors say she’s okay, I’ll support her. ‘I’d love Susanne whatever she looked like, but if she was a size-zero model I wouldn’t have noticed her in the first place. ‘We met online and exchanged photos when we were courting. I thought she was beautiful. ‘I’ve always preferred bigger girls. To me there’s nothing attractive about a skinny woman. It’s more ladylike to have curves. Susanne says she has gained several stone since her last weigh-in last year when she registered at 54 stone. She had hoped to be three stone heavier by the end of 2011. ‘It’s harder to gain than you might think because I’m trying to stay as healthy and active as possible,’ she said. ‘I’ve been slowly upping what I eat. It’s like an athlete training but instead of training to be harder, I’m making myself softer. As Susanne, a size 10XL, continues to balloon, Parker takes her and her sons to the park on day-trips – wheeling Susanne around in her wheelchair. ‘My mobility is decreasing,’ she said. ‘But I always knew this would happen as I gained. I get out of breath more easily and Parker has to push me in my chair more often. ‘When we go to the store he shops for me. He helps me in and out of the car. He encourages me to do my exercises. Reaching her goal would mean Susanne tops that of previous world record-holder Carol Ann Yager, who died in 1994 from kidney failure caused by morbid obesity. But despite warnings from doctors that she is playing ‘Russian Roulette’ with her life, Susanne says she can avoid the fate of others who have reached over 1000lbs (71 stone). ‘I do my best to eat as much healthy food as possible,’ said Susanne. ‘I do an exercise regime to keep me as mobile as possible and Parker helps with that. He makes sure I do my stretches and sit ups. ‘I want to try and break the stigma that being fat is bad. Playfully clambering over their doting mother these polar bear cubs spring into action for the most sociable time of the year. 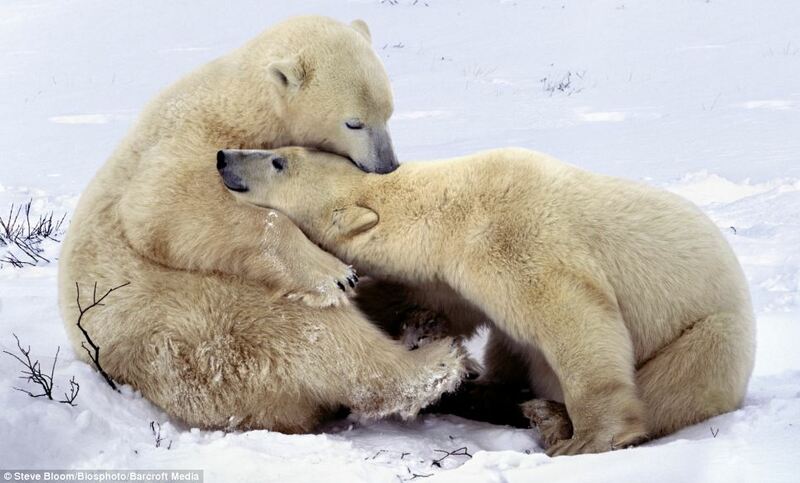 Across the polar regions from Norway to Canada these images show the intimate relationship between polar bear mothers and their young as they emerge from their winter hibernation. 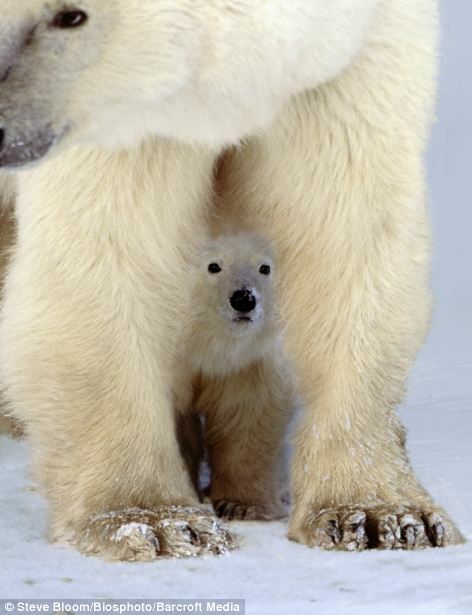 Each winter females dig dens, where they give birth to their cubs – usually two, but sometimes as many as four. The timing of the birth is sometime during early winter, between December and January. 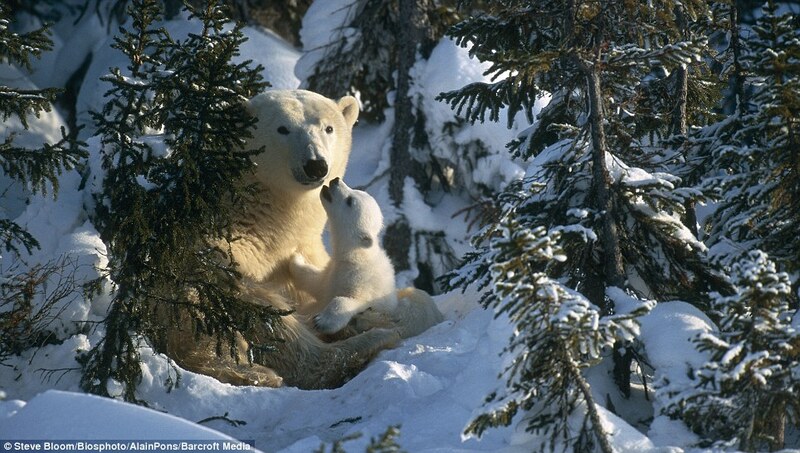 The snow den, the mother’s body heat and her milk, which is high in fat content, enable the cubs to keep warm and grow rapidly before leaving the den in March or April. Short trips are made to and from the den for several days as the cubs get used to the outside temperatures. 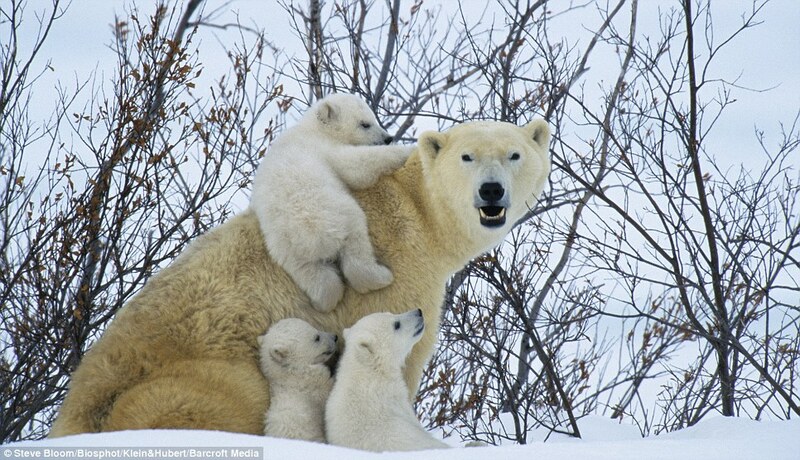 Then the family leaves and makes its way to the sea ice, where the mother teaches, hunts for and protects her cubs. After two years together, the family disperses and the cycle begins again. But not before a bit of light play in the snow. 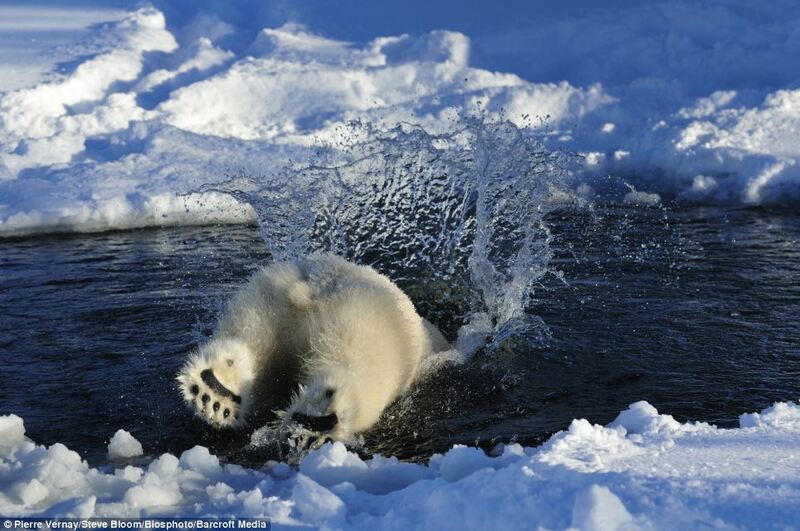 Photographers have spent hundreds of hours in the Arctic regions, photographing the amazing interactions from lounging around in the snow to diving head first into the icy waters looking for food. 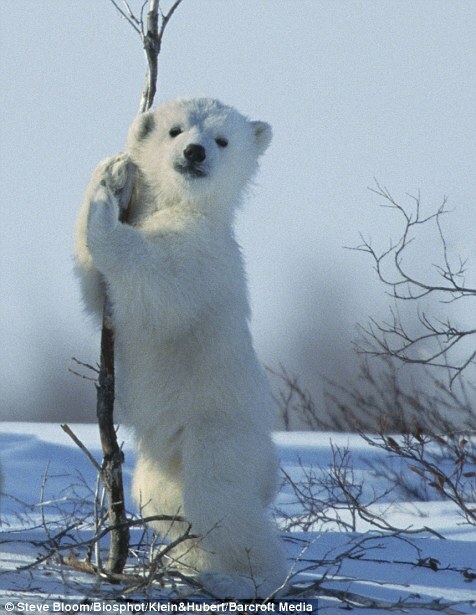 ‘The polar bear’s presence is entirely transitory, with photography dependent on accurate timing, the right weather and exceptional luck,’ said Steve. 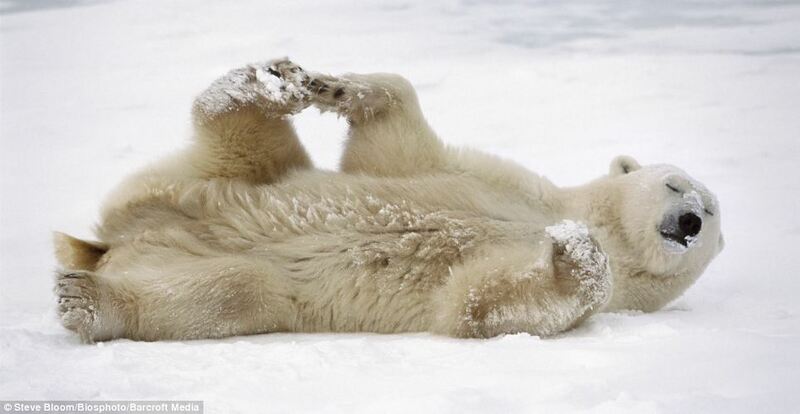 ‘Imagine a world without polar bears. 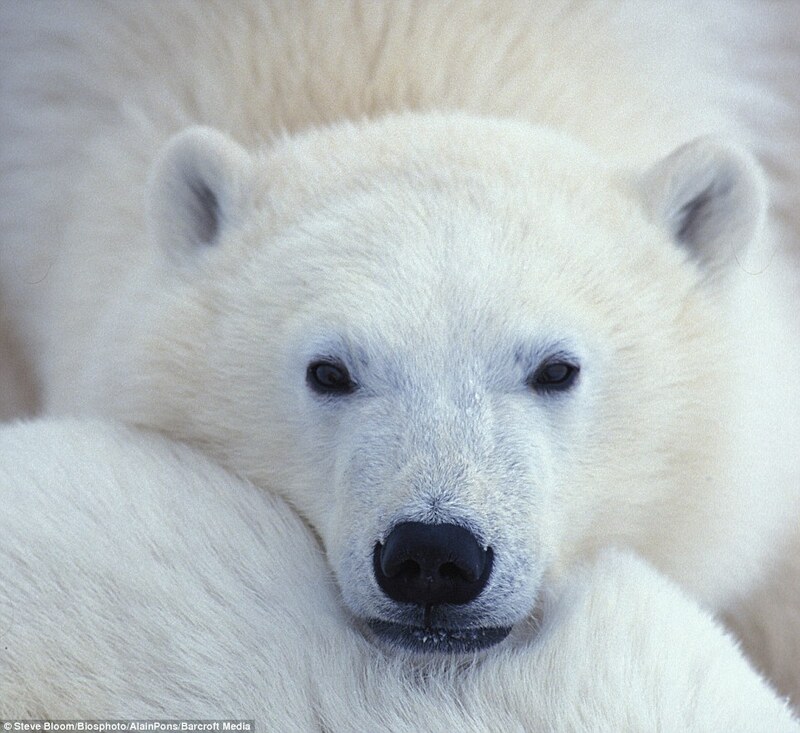 ‘It seems unthinkable, yet as climate change gathers pace, the Arctic ice floes upon which the polar bear depends are beginning to break up. ‘In the years ahead, this could be catastrophic for this truly charismatic bear which, when it stands up, is taller than the largest elephant. For years presenters of early morning TV shows have talked about their early starts and yet they never show signs of tiredness… until now anyway. At around 8:30am on Friday morning ‘BBC Breakfast’ cut to their BBC News Channel counterparts only to see newsreader Simon McCoy seemingly sleeping at his desk. 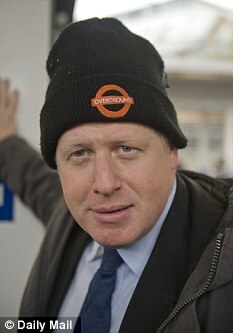 Viewers spotted him with his head resting on his arms, with many taking to Twitter afterwards to point out the gaffe. It’s not the first time Simon McCoy has made the headlines with his strange antics. In 2009 he was caught doing push-ups at his desk and a year later the BBC had to apologise after a weatherman was caught on camera making a rude gesture at McCoy. 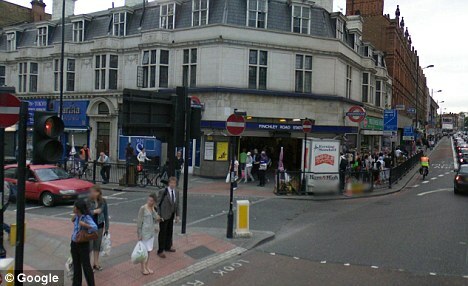 A boy of five was dramatically rescued after he fell under a Tube train just as it prepared to pull out of the station. The driver had been given the ‘all-clear’ to pull out of Finchley Road station on Sunday evening when the boy – boarding just before his parents – slipped down the gap and tumbled onto the rails beneath the carriage. As his desperate parents rushed to reach the boy, the driver prepared to drive – but carried out a quick last-minute check on his cabin’s CCTV and saw the boy’s hands reaching up as he tried to climb out. The unnamed driver, who was on his final northbound journey on Sunday night, has been hailed a hero for his careful observations and then his quick reactions in slamming on the breaks. In a statement, the driver said: ‘A small child fell beneath my train trying to board while the doors were closing. ‘Thankfully, I saw something and was staring at the CCTV when I saw the hands come up on the platform. 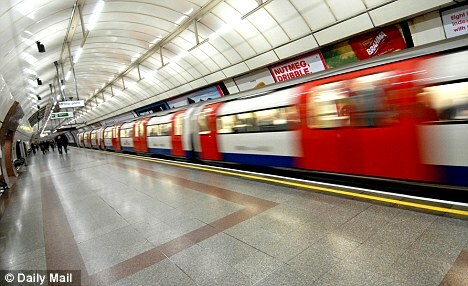 Aslef, the driver union, stepped up their opposition to driverless Tube trains after the incident. 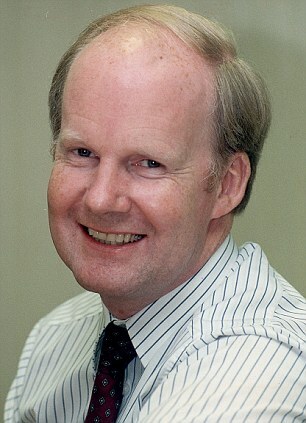 General secretary Mick Whelan said all the automatic devices in place showed the platform was clear and it was safe for the Tube train to depart – and only the driver’s action saved the child from death or injury. He said: ‘The driver, on a final visual safety check, saw a tiny hand reaching up from the track. ‘The train remained in position and a young life was saved. ‘Mayor Boris Johnson has been playing politics with the issue of driverless trains. He thinks he is currying favour with voters with this stand. How many votes are a young child’s life worth? How would he explain to those watching horrified parents that his proposal is a good one? ‘On Sunday all the automatic devices showed the platform was clear. Only a driver could have averted a potential tragedy. London Underground’s network services director Nigel Holness said: ‘In this case our staff followed their established safety procedures to bring the incident to a safe conclusion and without injury. ‘The whole design and operation of the network would be different with driverless trains and therefore we cannot compare the two. Transport for London confirmed that the child fell between a stationary train and the platform at Finchley Road station, adding that staff followed their established procedures to swiftly respond and bring the incident to a safe conclusion.